Wednesday, Jan 16, 2019, 5 – 5:30 p.m.
Meet Foster EMBA Online gives you an opportunity to participate in a live information session from your desk at work or at home. The session includes a general overview of the Foster EMBA Program. The session is about 30 minutes in duration and is led by the associate director, Randell Hernandez. 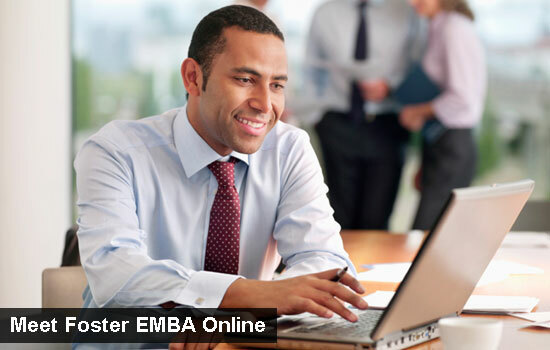 Register today for this Meet Foster EMBA Online session. You will receive a confirmation message and reminder e-mails with the link to access the session.